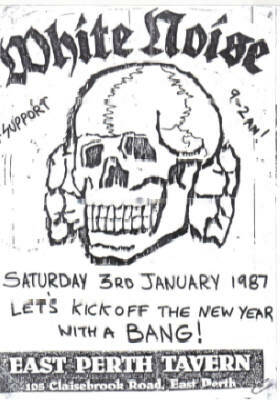 The following interview was retrieved and re-typed from a Melbourne zine dated 1988 as far as i can tell (no exact date on the zine) - THE STORM TROOP no.3. 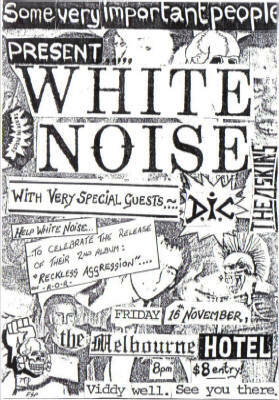 This band is probably the best band to come from Australia that i've ever had the fortune to listen too. 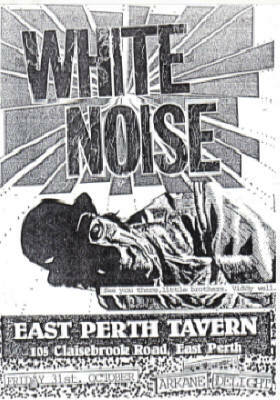 They are WHITE NOISE, who hail from Perth, so far they have not put anything down to vinyl but an L.P is soon to be released, however the date has yet to be finalised, it should be mid '88 i am told. This is the interview that i conducted with Jim their vocalist while he was in Melbourne a few weeks ago. How long has the band been together, and what's the present line up? About 3 years, GLEN - Guitar, JAMIE - Bass, MUSSOLINI - Drums, JIM - Vocals. Previously, had any of you been in any other bands? All of us have been in previous bands, Glen and Mussolini are ex-Quick and the Dead. Myself and Jamie are ex-Headbutt 100. 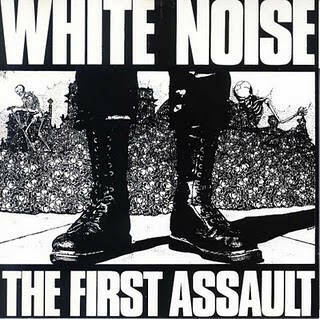 What made you choose the name WHITE NOISE? What do you feel you have achieved as a band? How many gigs have you played and do you think you'll ever play gigs in the eastern states? Purely because of the Nationalist overtones. Mainly keeping the local skinheads and Herberts from fading away. I've lost count of our gigs and i do wish to play over east but money forbids. It is reported you will be putting out an L.P very soon. What will it be called? What tracks are on it, when will it be released and which record label is it coming out on? As yet it's un-named: to be released mid-88 and it will probably be on Rock 'O' Rama. What bands/people influence the band and you personally? 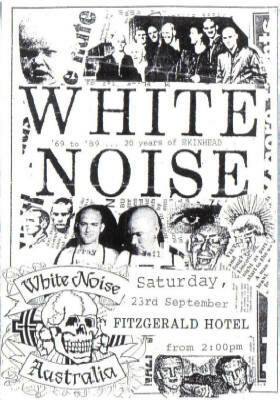 Bohse Onkelz, Motorhead, Skrewdriver, 4-skins and any fast, loud bands that don't sing about lefty points of view. Do you support any particular political party? Yes, The Australian Nationalist Movement along with the B.M. and K.K.K. What things in Australian society concern you most? If any, what message do you try to get across to your audience, when you play live? 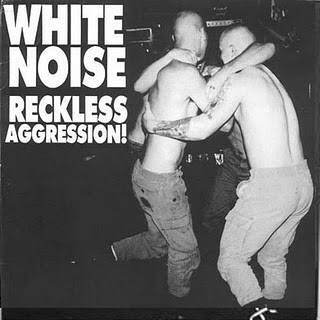 Mainly - as a sense of pride in race and pride in being a skinhead. What are your thoughts on Australia's future - Good or Bad? Bad, unless we can convince our white Australian population that they are doomed to Racial-social decay through race-mixing. Do you think that white unity - worldwide is a good idea? 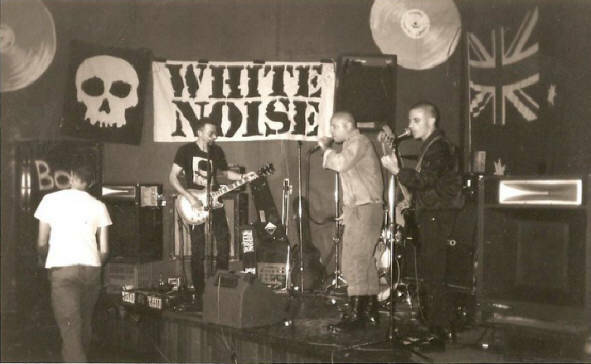 Only to record some more material and hopefully to go on playing to ever growing skinhead audiences. Any final comments you'd like to add? 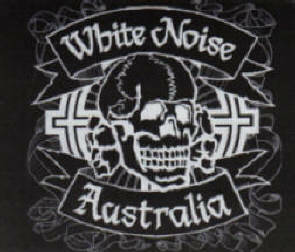 Keep your boots polished and your hair cut.....and keep Australia WHITE! 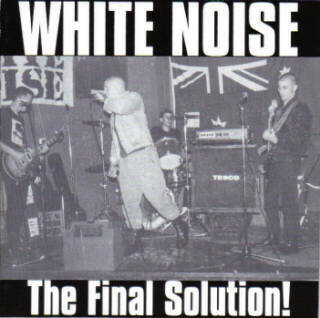 Thanks for doing this interview Jim, all the best to WHITE NOISE and all Perth Skinheads.